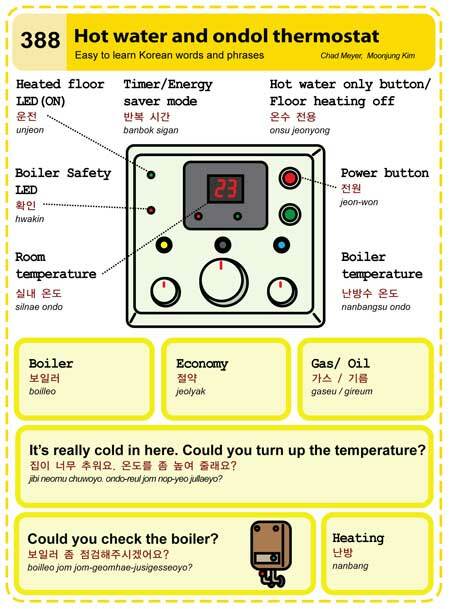 The temperature is hovering around 0 degrees Celsius and I’m sure there are foreigners in Korea trying to figure out their hot water and apartment heating controls. Korean apartments are heated by a system of steel or copper water pipes coiled below the floor. This type of floor heating is unique to Korea and is called 온돌, which literally means hot stone. The modern heating system is derived from traditional houses which were built with a kitchen slightlty lower than the rest of the house. The smoke from the kitchen’s fire was channeled under a layer of stones placed beneath the floor. When heated, the stones became hot for extended periods of time. And since heat rises, they kept the air in the house warm. 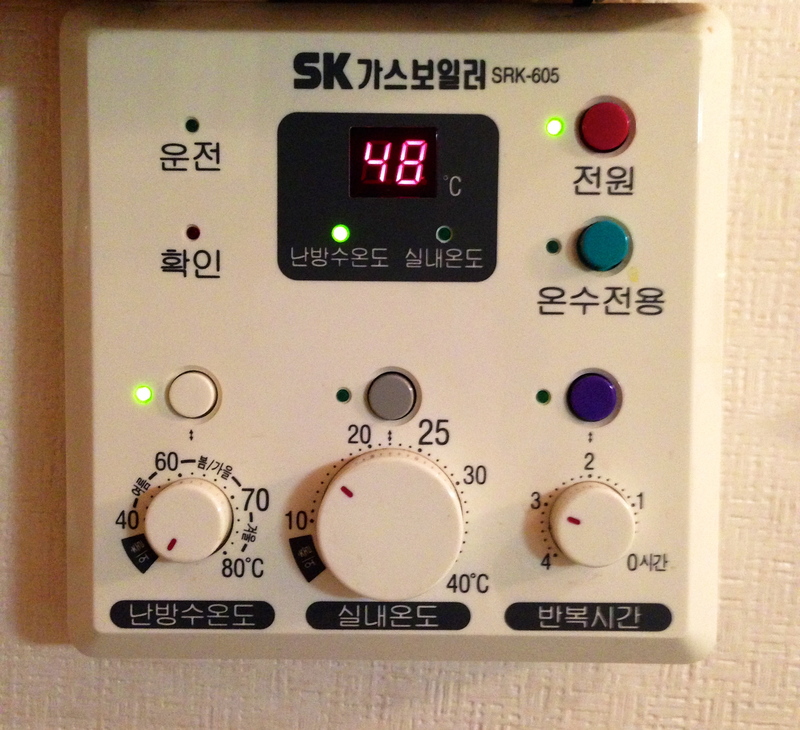 Today, all Korean apartments are built with an ondol heating system. Most Korean restaurants also offer a floor-seating section where patrons can feel the warmth from sitting on the floor. 1. Since the floor is always hotter than the air, it can be uncomfortable to walk around your apartment. My feet always feel like they’re on fire. 2. Anything located near the floor will get hot. Be careful of the lowest shelf in cupboards. I have seen food melt or simply change in taste. 3. It’s really cold outside, so people tend to crank the heat up when they get home. It then becomes too hot and we end up having to opens the windows. The ondol takes longer to heat up the apartment than a traditional ventilation system and it also takes longer to cool down. You’ll have to play with the controls to find the balance that’s most suitable for you. 4. The controls are difficult and simply don’t make sense (see below, my apartment). -The controls are used for both the apartment hot water boiler and the (room) thermostat. -The red LED display shows either the hot water temperature (floor) or the air temperature of the room, depending on which mode is selected. Most often, you’ll find that these two temperatures are not the same. -The newest apartment may have a simpler control system, more like the ones found in the US. We’ve been told to use the floor temperature controls (Choice C,i) and not the room temperature controls (Choice C,ii) as they’re more efficient. This seems to make sense since the heat for the air comes from the floor. -Never completely turn off the power to these controls. During the winter, the water pipes can freeze and burst from the expanding cold water. And since the pipes are located below the floor, they’re expensive to fix or replace. When you’re not going to be home, especially for extended periods of time, you can turn off the apartment heat while leaving the hot water boiler on. 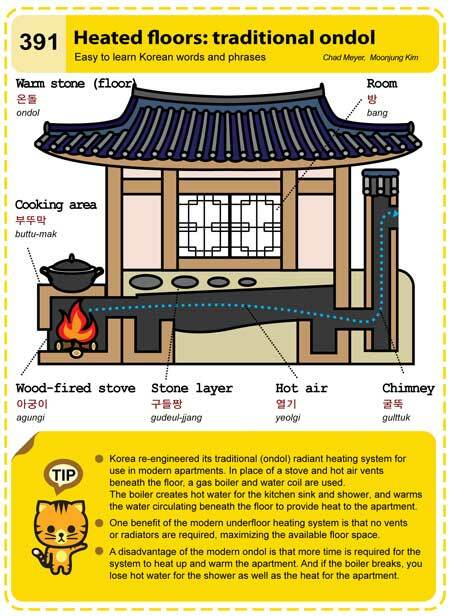 This entry was posted in About Korea, Series and tagged boiler, heat, heated floor, heating system, hot water, ondol, thermostat, traditional house, 온돌 by easykorean. Bookmark the permalink.